Sway is an innovative company focused on reinventing medical outcomes measurements. Our mission is to advance outcomes-based patient care with practical and sustainable medical grade mobile diagnostics that push towards quantifiable outcomes and fit into the current reimbursement model. Our core product is the Sway Balance™ System, an FDA-cleared mobile software application that revolutionizes the way athletes and patients are monitored for signs of musculoskeletal, neurological and vestibular dysfunction. Health care professionals can quickly evaluate postural stability by instructing the patient to press the mobile device against their chest while performing the instructed balance protocol. 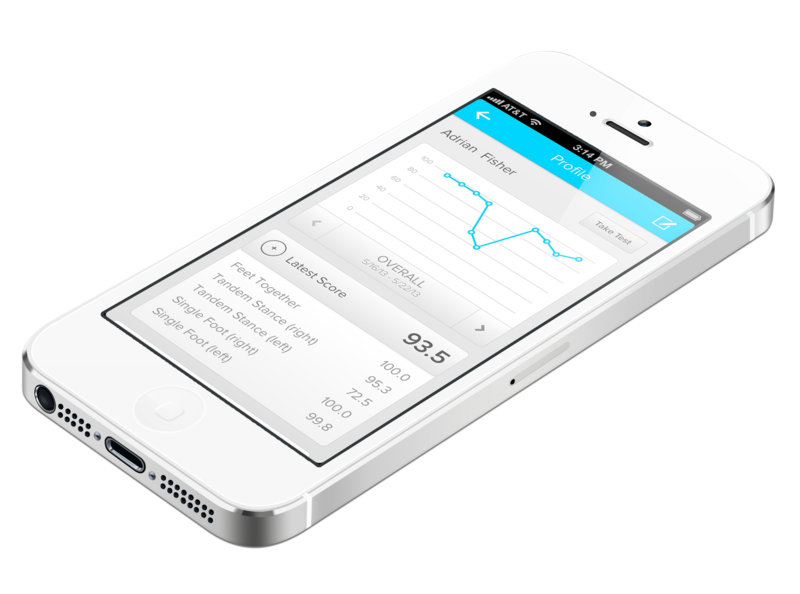 Balance is measured by analyzing thoracic sway from the mobile device motion sensors for the duration of the protocol. Assessment of balance has been established as a medically necessary clinical measure for many health conditions. Physicians can perform a balance test as a physical performance test to evaluate patients who show specific signs of neuromuscular dysfunction. Balance assessments are physical performance tests that provide important information on neuromuscular and vestibular function or to validate patient progress. To properly code for a balance assessment, a physical performance code should be used on the 1500 form with the appropriate modifier, code pairing and documentation with a Sway Medical Report. Based on independent third party review, Sway Medical recommends using the following coding structure for Physicians, Physical and Occupational Therapists and Neuropsychologists. Notes: Billable event ONLY if physician discusses results of the testing with the patient as a part of the evaluation. Notes: Cannot be billed with Evaluation or Re-evaluation (97001 – 97004). Performing a Sway Balance assessment in a Neuropsychology setting does not typically include additional physical performance codes. Sway recommends that Neuropsychologists include the Sway Balance technology into the standard neurobehavioral exam with CPT codes 96116 or 96118. The value of Sway to the Neuropsychologist is a reduction in the time it takes to perform a physical performance tests as a part of the neurobehavioral exam. Sway provides an easier and more objective tool to reduce the amount of time spent on testing balance. A requirement of the physical performance code 97750, is a written report detailing the outcome of the test and specific treatment considerations as a result of testing. 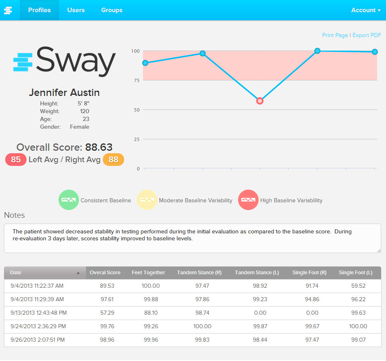 Through the Sway Medical portal https://my.swaybalance.com you can select the patient you have tested and produce a report. Provide comments in the “Notes” section of the report and then print or export to your patient file. The suggested billing recommendations are based on national Medicare standards and a third party assessment of the Sway Balance™ product. The recommendations are meant for illustrative purposes to highlight some of the known requirements in each field and are not a guarantee of claim payment. Independent insurers have both paid claims and denied the use of physical performance codes in the evaluation of patients based on the premise that performance codes should not be additional charges. It is important that providers consult with payers, reimbursement specialist and/or legal counsel regarding coding, coverage and reimbursement matters instead of solely relying on the recommendation in this guide. Sway Medical LLC encourages providers to submit accurate and appropriate claims for services. Laws, regulations and payer policies concerning reimbursement are complex and change frequently. Providers are responsible for making appropriate decisions relating to coding and reimbursement submissions. The enclosed reimbursement recommendations are based on information gathered from third-party sources and is presented in this document for illustrative purposes only. This information does not constitute reimbursement or legal advice. Sway Medical LLC makes no representation or warranty regarding this information or its completeness, accuracy, timeliness, or applicability with a particular patient. Sway Medical LLC disclaims liability or responsibility for the results or consequences of any actions taken in reliance on information in this document.